And I was completely oblivious to the fact that I had lost it! No, smartass, not my mind. I’ve been aware of THAT loss for quite some time now, but thanks for stating the obvious. No. I’m talking about my knitting momentum, my mojo, my augury; that which makes all knitting undertakings enjoyable and exciting and challenging and fun! My enthusiasm for the sticks and strings waned so gradually I didn’t even notice it was gone…until I got it back. It hit me upside the head like a paternally-delivered pew-based to-the-back-o’-the-head-got-caught-sleeping-during-Sunday-sermon stealth bitchslap from my childhood. Unfortunately, it ALSO showed in my posts too, which, in my book, were more BLAHg-worthy than blog-worthy. No sense in denying it. I could HEAR you all screaming at your computers: LA! BE LESS BORING! But that’s all ancient history now, or let’s hope anyhow. Now I have a gazillion projects I want to do, and I want to start them all now. NOW I say! It’s not like I don’t already have the yarn for most of them. Well, all the non-pink ones anyhow. I have a surprising lack of pink yarn in my stash. Must rectify that and soon. The only thing that I can attribute to this serious re-kindling of the knit love is my most recent FO. 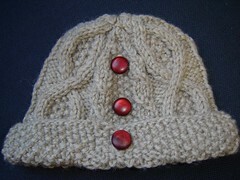 Cap: La Fudgery, aka…winging it, but based the smaller version of the cables on the Trellis pattern. Notes: Okay, everyone look at those pictures closely. 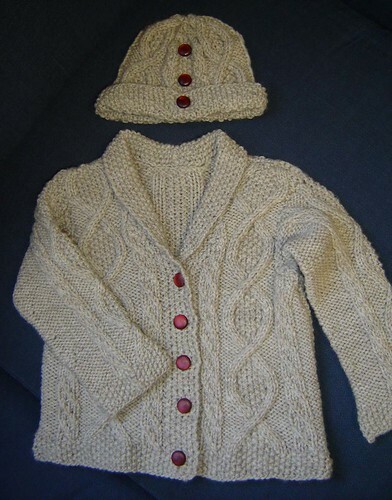 There is something TRULY amazing about that baby sweater. Give up? Ok, I’ll give you a hint: Look at the sides and the sleeves of the sweater. Do you see it now? YES! 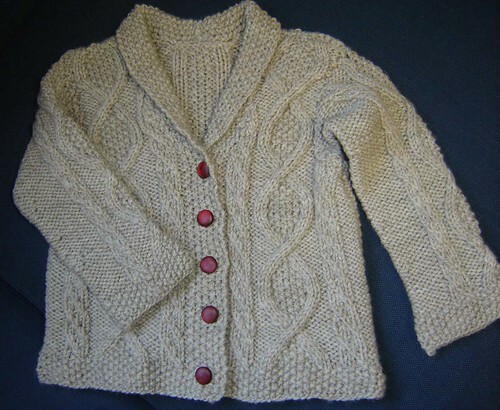 La fully completed a sweater….with side-seaming and sleeve attaching and button sewing on and everything. And those seams? Even though I tried Stacey‘s brilliant lazy little cheat seaming, I ended up doing mattress stitch. Yes, folks, pigs DO fly! Yeah, well, I clevered myself into a tight spot…literally. The top-o’-the-sleeve circumference was WAY smaller than the armscye. hhhhhhhhhhhhh It took some doing; a little fudging in the side seam here, a re-bind-off there, and a tad of stretching, but as you can see, it all turned out ok. The other thing I like about this sweater? It’s not pink. The DH informed me that Chrissy had cried to him, “everything they gave me at the baby shower is pink.” Well, my first thought was “Duh! You’re having a GIRL!” But then I’m all, “WTF? Do they even KNOW Chrissy at all?” That woman, though feminine and girly, is NOT a pink kind of gal. What makes anyone think that the non-pink mama’s gonna want to surround and dress the baby in pink?